Don’t blame investors for investing, that is their job. The only job founders/companies have, meanwhile, is to build a sustainable, long term business. “High growth at all costs” is NOT a necessary condition to it, merely a causation founders have backed themselves into if they raise too much money. There seems, to me, to be one central truth to any content business in the digital age: attention is far from infinite, and is very, very scarce. 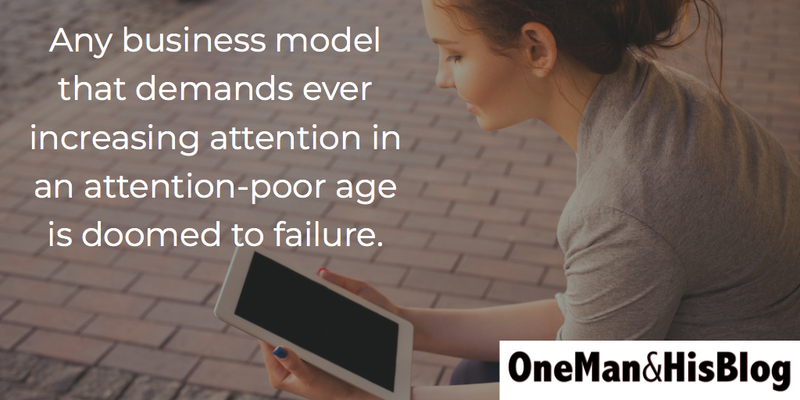 Any business model that demands increasing attention in an attention-poor age is doomed to failure, sooner-or-later. Much better, for all but the very biggest sites, to find a comfortable niche, and figure out how to make diversified revenue from it.